Maybe it’s because I had an excellent yoga class earlier tonight, but I’m suddenly in a mood to recalibrate a few things in my life. Starting with my palate. Although that’s more of a work excuse than anything else. After a long break from tasting wine at Wine & Spirits, I’m about to start regular panel tastings again tomorrow. And here in San Francisco, that means all North American wine, all the time. As part of that long break, I’ve been drinking mostly European wine (and of that, mostly Italian), and without going into the details, it’s been quite lovely. Tonight though, I wanted something from California, and taking that theme further, I wanted zinfandel. Not my usual choice, I know, but I think I might be a closet zin lover, a log cabin member of ZAP, as it were (kidding). But what I pulled out of the cellar wasn’t entirely zin, and damned if it doesn’t taste downright Mediterranean. Once upon a time I was a member of Ridge’s ATP (ATP=Advance Tasting Program) and I have a delicious collection of Ridge wines as a result. I opened one of these–a 2000 Mazzoni Home Ranch–this evening. According to a history on Ridge’s site, one Giuseppe Mazzoni and his brother-in-law Abramo Trusendi (who was apparently all of 14) arrived in California from Italy in 1898 and began working at the Italian Swiss Colony in Asti, Sonoma County. Long story short, they eventually bought land in Alexander Valley and planted a vineyard of ‘mixed blacks’ there: zinfandel, carignane, petite sirah and a slew of other such grapes. Ridge has made wine from this vineyard since 1996. This bottle of 2000–which is almost done, sadly–is tasting great, all fresh red berry and red plum fruit, with snappy acidity. Delicious, and perfect with tonight’s impromptu pasta tossed with roast purple cauliflower, pine nuts and capers. And a little pancetta for kicks. 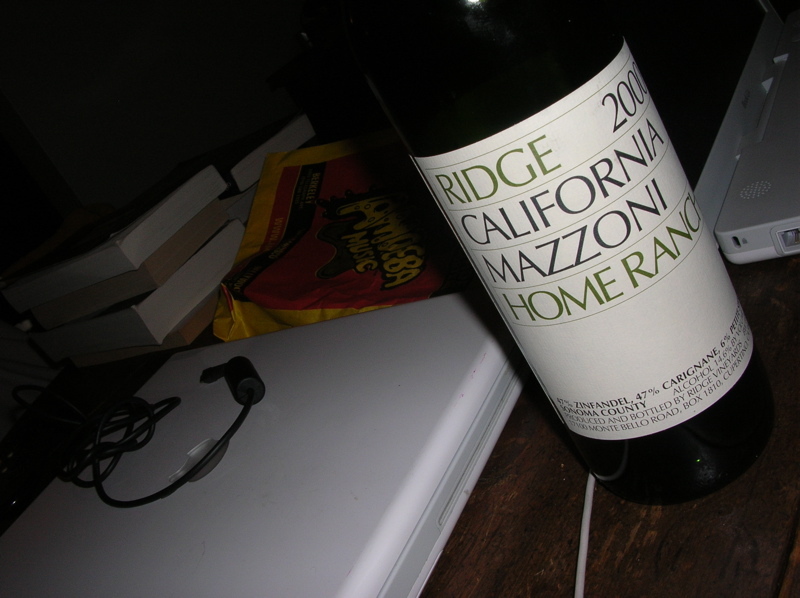 This entry was posted in tasting wine, wine and tagged Mazzoni Home Ranch, Ridge, Ridge ATP, Wine & Spirits, Zinfandel. Bookmark the permalink.